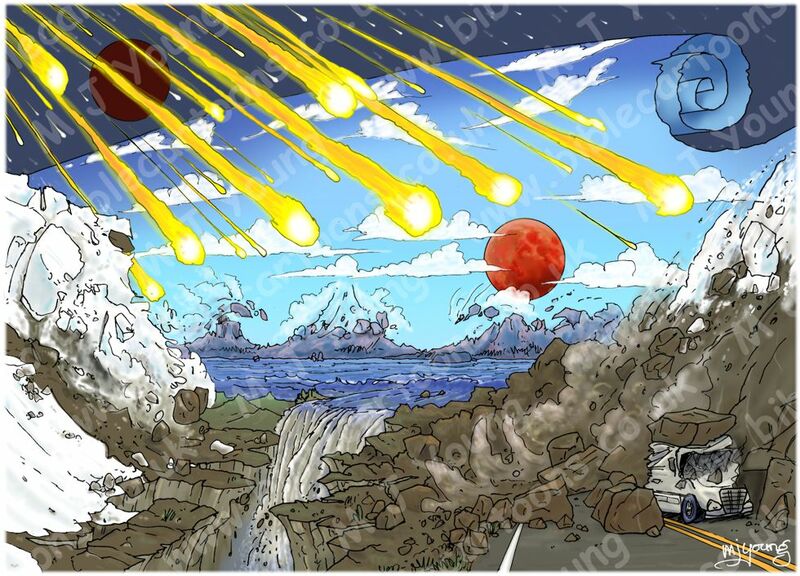 I’ve just completed a new Bible Cartoon which shows a pretty dramatic scene: the end of the world! Above is the pencil sketch I produced before moving to finished, coloured artwork. You can see the two variations of the finished scene below. 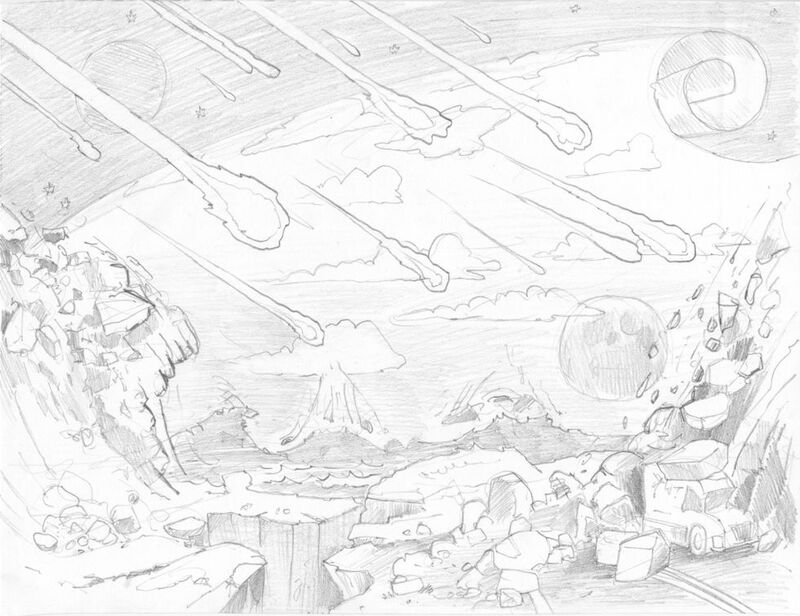 One of the differences between the sketch and the full colour finished scene is the inclusion of the sea disappearing down a huge crack in the earth. The scene was exciting to draw and colour up, with the darkened sun (top left of scene), the blood red moon (middle right of scene) and all those stars falling from the sky. Interestingly the sun’s diameter is about 400 times larger than that of the moon, however the sun is also about 400 times farther away, which is why the sun and moon appear to be nearly the same size when viewed from Earth. That’s why they are drawn the same size in my scene too. I usually draw a black outline around objects in a scene, and have done so in these pictures as well. However, I decided that it was distracting for the falling stars to have that stark black line, especially as they are very luminous objects: the black seemed to contradict their brightness. So I decided to apply some of the yellow/orange colour used in the falling stars to their black outlines, which helps to maintain their brilliance. One part that was very interesting to draw was the Bible’s description of what happens to the sky, which verse 14 describes as “The sky receded like a scroll, rolling up…” You can see from my drawings that I have literally drawn that feature. I found some exciting scenes on the internet which helped me to draw the avalanches and rock falls in the foreground of my scene. I decided to add the truck (see bottom right foreground) being squashed by a huge boulder to give a sense of scale to the destruction, but avoided including any figures being squashed, which would have been far too graphic! Incidentally, the road which the truck was driving one has double cadmium (yellow) lines down the centre, indicating that it is an American road, rather than one from Great Britain: we have white lines in the middle of our roads.